Sign up is available on a first come, first served basis. A high visibility, low-tech forum on Monday nights at Judson Memorial Church throughout the fall and spring seasons. Movement Research at the Judson Church is one of a number of MR programs intended to serve as a creative laboratory and incubator for wide-ranging artistic investigations in movement-based forms; this series is a platform for artists at various stages of their creative development. 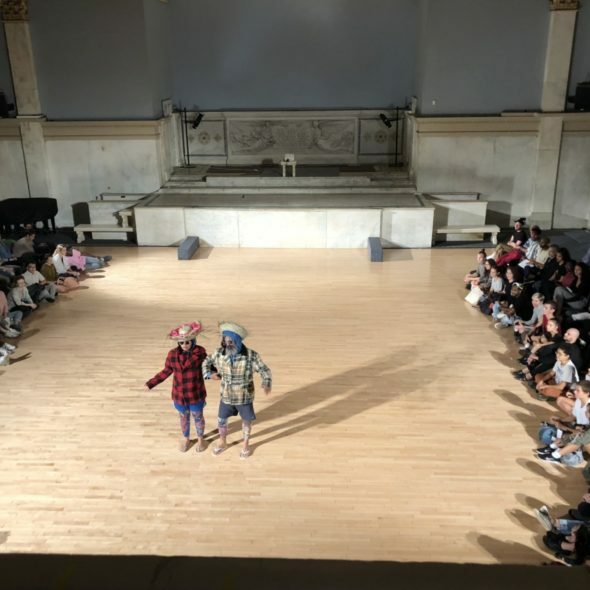 Movement Research at the Judson Church artists are selected through an application process reviewed by a rotating committee of peer artists; each season the Artists of Color Council (AoCC) invites a member of the community to curate three artists to participate. These artists are joined by Movement Research Artists-in-Residence and GPS/MRX exchange artists. Open Performance Call for the Spring 2019 Season goes live at 10am EDT on October 20, 2018! The application for the Spring 2019 season of the Movement Research at the Judson Church series is now closed. barbara mahler's dances, Janis Brenner, Melanie Greene, Kristina Hay + Hilary Brown | HB² PROJECTS with Jessica Nina Barlow + Lamy Istrefi Jr.